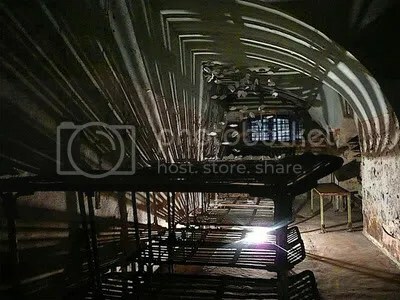 Patarei Prison–This former prison-turned-museum, easily accessible by foot or bike from the Old Town, is open for guided tours in a variety of languages. The caretaker told us someone had recently rented it for a birthday party. One ward was full of site-specific art installations, including sound- and light- art. There are guard towers to climb, outdoor cages to peer into, and gallows to gawk at. Many remnants from the prison’s inmates and employees are left behind–a full library, office files, newspaper clippings and graffiti, clothing still on hangers. We went 3 days in a row until the man in charge realized we loved the place as much as he did, and he finally let us wander around alone. 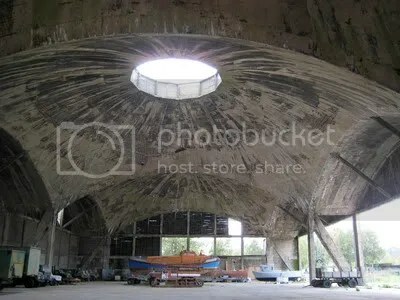 Officially billed as a “Maritime Museum“, the unofficial highlight of the sprawling campus, where there wasn’t much else to look at, was the echo chamber formed by the domed concrete ceiling sheltering rusty boats. Every pebble scratch or hand-clap reverberated in 360 degrees. The structure was technically closed off to the public (chunks of fallen concrete from above provided a good excuse as to why) but it wasn’t closely watched. Olde Hansa restaurant in the Old Town could be considered a tourist trap, with its medieval decor and relatively high prices, if it weren’t for its absolutely delicious food and *cinnamon* beer. 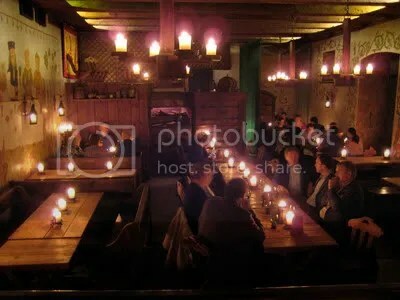 The candlelit ambiance and yummy soup in funny terra cotta dishware had us coming back for more.